Sean “Bawney” Reynolds from the MLG has posted a video review of our Access Controller. You can check it out below! Remember the PS2/PS3/PC version of this controller is now available and you can buy it by visiting this link. As for the Xbox 360 version we’re still working on it – fear not! It has come to my attention that a few users have had difficulty with sticking buttons on the Access Controller, or buttons that are hard to press. This will be address in future runs/shipments of the product. In the meantime I have come up with a workaround that can greatly improve the “pushability” of the buttons and requires only an screwdriver and X-Acto knife. Click below for instructions. Thanks to everyone who’s bought on thus far, and be sure to spread the word! So it has come to this – a tutorial for modding my own product! 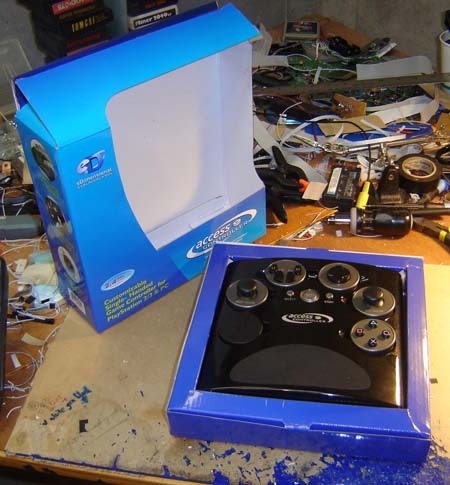 In this article we’ll discuss how to mod the PS2/PS3/PC production model of the Access Controller to add you own custom controls such as foot pedals, extra buttons, etc. You could also build it into a MAME cabinet, use it wirelessly with a PC, all sorts of stuff. Instructions begin below, enjoy! The time has come! The PS2/PS3/PC version of the Access Controller is now shipping, in case the headline above somehow slipped your view. Unboxing the unit. I went with a much simpler “blue” look for the box this time, with a couple Easter Eggs on there as well. You can use the link over on the right-hand side of the site to place your order and read more about the unit. I guess you could also click right here, wow copy/paste is awesome! We’re still working on the Xbox 360 version (review process and what not) and will keep you posted once we know more. But yes, for the Sony and PC fans though you’re ready to go… hope it works well for you! Coming next week: a How-To guide on modding this controller to add your own peripherals. 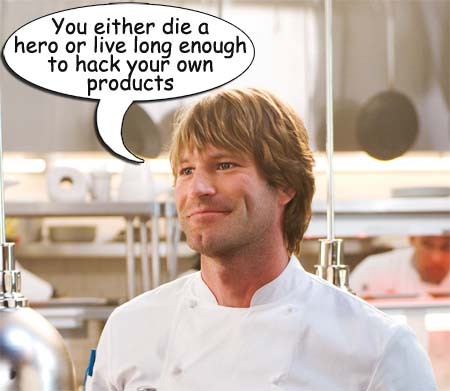 Yes, that’s right – how to hack a Benheck product. The bus-like nature of the module plugs and the fact there’s always one empty make this quite doable and easy. Add a foot pedal to better help those in need, a larger joystick, all sorts of stuff… stay tuned! Apparently I made the list, check out the latest issue of PC Magazine! In other news the PS2/PS3 version of the Access Controller is shipped very soon, next week I believe, more info as it becomes available.